Our family made a big move to Devon two years ago and a business that my husband and I ran closed as it required regular visits to East London. I wanted to keep working, not just for financial reasons but because I enjoy business. However I have three young children so finding a job that would fit in between the school run and holidays just wasn’t feasible. I did not relish the thought of being an employee after doing my own thing for so long. I gave a lot of thought and research as to what type of business I could initially run from home. 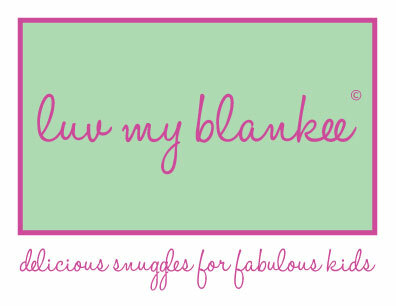 Eventually through a stroke of sheer luck, the idea for Luv My Blankee was formed. It took about twelve months from conception to fruition and the business went live in June this year. What is your role within your business? I’ve designed and created my e-commerce website. I write and manage my PR. I handle all my social media. I’m book keeper, administrator, planner, marketing manager, designer and packer. It’s just me and with no investor behind me I just don’t have the funds to pay third-party agencies. What do you like doing most in your business? Processing sales orders. Every time an order comes through I feel like a firework should be let off. What do you like doing least in your business? I’m struggling to understand how other people run businesses when they don’t return phone calls or answer emails or worse, miss deadlines. How many people do you work with in your business? I saw a gap in the UK market for a product that is popular in the USA. What is the best thing about being a mumpreneur? Being able to work around school pick up times and not missing any school activities. Also keeping on top of the washing daily lol! What is the worst thing about being a mumpreneur? Trying to work with three kids around you, particularly in the school holidays. It’s impossible to concentrate. What is your biggest challenge juggling family life with running a business? My husband works away during the week, so for four days it’s just me and the three children. Sometimes when I haven’t managed to complete a task before school pick up it may need finishing off in the evening when they’ve gone to bed. However having it all to do on your own, and the bedtime shenanigans mean by the time the last one has fallen asleep my brain has gone to mush. What business training did you have before or since you started your business? In my twenties I set up a marketing agency which did really well. My business partner and myself left school with just O levels. He focussed on sales, which he had a natural flair for and my role was account handling and managing all aspects of running a business which suited my attributes. After my first child was born I managed my husband’s business. I have no formal qualifications. I have to say that I’m a great believer that with some intelligence, a splash of common sense and a dash of natural business acumen many people can succeed in business without qualifications or training. How has this helped you with growing your business? If I struggle with something, I just turn to the internet. Most of my issues are IT based so I just punch the question into Google, read a few geek forums and somehow work out how to resolve the problem. It’s worked for me so far! Have you received financial help in setting up in business? If yes from whom? E.g – bank, investor, etc. I received a Government Start Up Loan. How important do you see networking to help your business? I’ve heard nothing but good things about business networking. However, most want a joining fee plus it’s a whole day out of the office or an evening event so it’s just not possible or a priority at this moment. What Social Media networks do you use to promote your business and how effective have they been? Social media is great and most of it is free. However it’s really time-consuming and there are too many (IMHO) self-titled social media experts all telling you how you can make a six-figure salary simply by jumping on board the social media gold rush. It has its place in the marketing mix but it’s certainly not the golden panacea for business success. If I were to update every social media platform daily, that would be my day filled up. I don’t want to outsource, before anyone suggests that, I’m the person behind the brand so I want content to come direct from me. Facebook – with FB changing their algorithms, my posts promoting my business get seen by around 50 people out of 2100 so you need to spend money if you want to post a direct sales pitch and see some results. It is a great way to engage with my followers though and when I post pertinent content the response has been great. It’s instant and easy. Twitter – I have around 1000 followers, but to be honest I’m not convinced how effective it is. Most of my feed is filled with competitions and serial competition entrants (compers). I’ve run a few competitions through bloggers and when I’ve taken a look at the entries the same names appear over and over again (serial compers ). I’ve met people who rave about it but at the moment I find it too time consuming to RT, @ and #. Instagram – a great way to take a quick non-professional snap of a new product or sample and share it. Google+ – I regularly post however my follower numbers are negligible. I don’t know anyone who uses it. Pinterest – I pin/share once a week and these pins get shared. LinkedIn – I try to post at least once every fortnight. It helped me find an overseas retailer who I’m in talks with to potentially stock my products. It’s definitely something I need to use more often. Do you think there is enough support for mothers who are also business people? There are loads of websites, groups and social media pages for working mothers and mumpreneurs so I do feel that there is enough support. What are the biggest challenges facing you right now? Finding investment to take the business further. Just get on with it and stop worrying about the what if’s. What advice would you give to other mothers who are thinking about starting a business? Avoid multi-level marketing or any get rich quick businesses. Don’t believe the hype, it’s just that. Just go for it. It won’t be easy but it might turn out to be the best career choice you could have made. Make sure you carefully work out your margins. Don’t forget to take into consideration your time. If the sum parts cost £5 it’s no good selling for £7.50 if you have spent 2 hours doing it. Now that you know more about Lucy’s business be sure to visit her website and tell your friends about her too.